Prepare a sabayon of egg yolk and sugar until thick. Boil milk and pour it in saboyon and cook it further over double boiler. Chop chocolate in a bowl and then pour the saboyon mixture and allow it to melt. 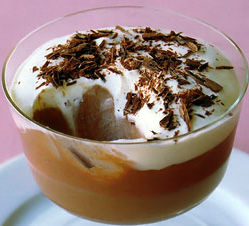 Whip up Dairy cream until soft peak and fold the cream into chocolate mousse. Set the mousse in a glass or use in cakes and many other products.